How to disable “Which device did you plug in?” prompt? Recently I got Dell Inspiron laptop. 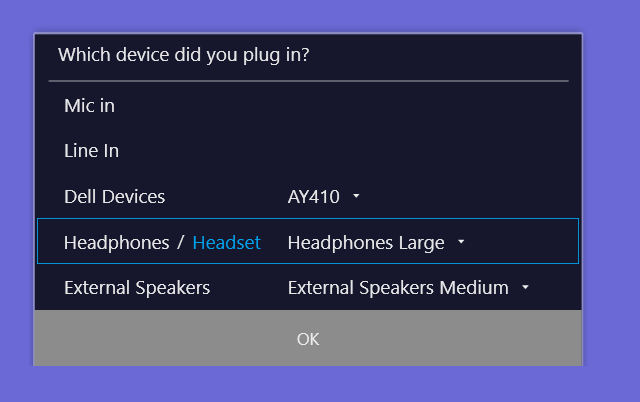 Every time I plug in my headphones it prompts me with this dialog Which device did you plug in? Is there a way to disable this prompt? I never get such prompt on other laptops. 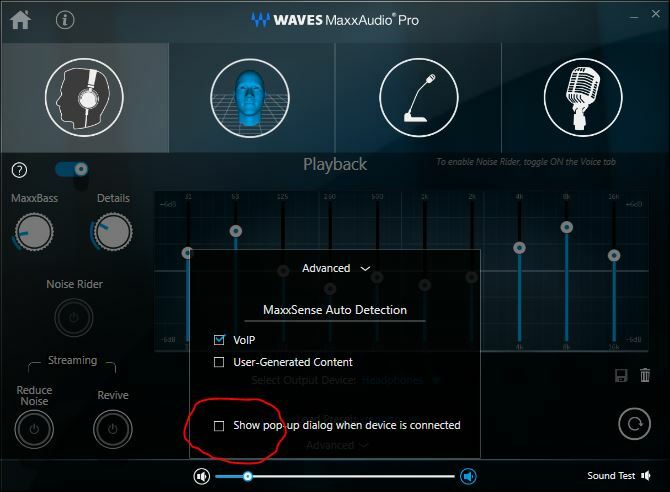 found WavesMAXX Audio settings, and opened it's properties, to find its full path C:\Windows\System32\DriverStore\FileRepository\wavesapo.inf_amd_whatever is next..
opened executable thereMaxx AudioPro and tune-up the settings to pop-up the window on JACK insert. Press Windows + R, type control panel and then hit Enter, select Hardware and Sound. Scroll down and select Realtek HD Audio Manager. Click the folder icon just above and to the right of where it says analog back panel and just below Device Advanced settings. Uncheck Enable auto popup dialog when device has been plugged in. Now, restart the computer and check the issue. Open task manager: right-click on the Windows taskbar > Task Manager. This removed the prompt for me, and I've had no trouble with audio so far. Not sure what else these do but you can always enable individually if you wish. If you have an Alienware use Alienware audio advanced then jack info that is actually how I enabled mine works to disable too. They have removed that check box "show popup ..." from the prompt in the latest version. You cannot uninstall as well. But I went to "services", disabled Waves Audio Service and rebooted. No more annoying pop-up when I plug in the headphones. Thank you all for your responses. This is the hopeless feature that anybody can implement - what an horrible business usecase? who needs this functionality???? Not the answer you're looking for? Browse other questions tagged windows-10 audio dell-inspiron headphone-jack or ask your own question.